What was it like to fly in 1911? We want to be told it was like the birds—the man-birds as they said—like the eagle and the skylark. We want to hear talk of air ruffling feathers, of floating along dreamily among the clouds. We want poetry. But flying was something altogether different. It was struts and wires, engines and oil, wind in the face, and crowds that rushed an aeroplane eager to sign their names on it or tear it apart. All the bird poetry and metaphor exist for the earthbound. Worthsworth, Keats, and Shelley kited their aspirations on the wings of the lark. They remained on the ground. Flying was so unbird-like, one of Atwood’s passengers had said. Once airborne, the pilot is not the “man-bird” of early aeronautics, no more than a man in the woods is a “man-deer” or a “man-fox.” He is a man in his machine in the air. His poems and stories are about his machine—his ingenuity—and all that presses in on it: the night, the weather, the things that go wrong. He has “conquered” the air. And for all that, flying was wonderful. It wasn’t poetry as the world knew it, delivered from the English Lake District to the parlor sitting room. It was something at once joyous and terrifying, something that in 1911 was part circus, part science, and a hint of things to come. “I assure you, learning aviation lacks poetry,” said Lt. J. Conneau, a Frenchman who had won three big European cross-country races in 1911. “Before a pilot flies, he must needs lay up a store of physical endurance; his nerves must be perfectly steady.” In winning his three races—circuits of Britain and Europe and a race from Paris to Rome—Conneau flew against great winds, though hot sun and the chill or storms, arriving at each stage exhausted and muscle-sore, desiring only a warm meal, a bath and sleep. The uncertainty itself was tiring: the difficulty of judging the weather aloft while on the ground, the danger of getting lost or being turned around in the clouds, the unpredictability of the motor, the worry of running out of fuel and having to find quickly a field for landing. Three aviators had been killed and two others injured at the start of the European circuit. Aviators had little knowledge of turbulent winds, dives and stalls. Aeroplanes folded up in the sky, they stalled, they pitched over on the ground. A steep bank or a steep dive might be too much. Things happened in the air that no one had words for—an entire vocabulary was lacking. In a stall or a dive or a tail spin, aviators would instinctively try to fight the aeroplane, often hastening the plane’s break-up and collapse. Most accidents occurred at low altitudes, 200 to 1500 feet. There was little room to recover, even if the aviator had known what to do. In one accident, a spectator counted seven seconds as a plane dived to a crash. The aviator, at a loss in his last moments, stood up as if pulling back on the reins of a horse. Almost anything taken for granted today was lacking. There were only a few rough airfields, sketchy weather forecasts, few flying instruments (the Wright-trained pilots had a piece of yard tied to a strut—it was a turn and stall indicator), no standard octane ratings for gasoline, no maintenance procedures to prevent failure from fatigued and stressed materials, no brakes for landing, and only recently wheels. Construction varied widely, from flimsy planes of bamboo and linen that could barely support their own weight at rest on the ground to the careful work of the yacht-builder Burgess. 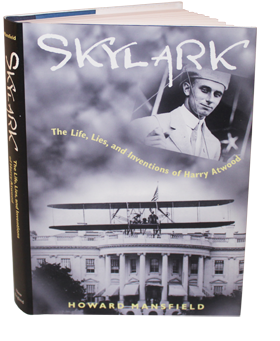 "“Mansfield provides an engaging account of early aviation history, and his book evokes the early part of the century when Americans embraced the promise of technology, when progress-even in the form of an airmobile-seemed possible and limitless."